Owens Corning fiberglass insulation, with its trademark pink color, has been one of the best recognized insulation brands since the 1930s. Their PROPINK Complete™ loose fill insulation is well suited to large commercial operations while their R-13 FIBERGLASS is a perfect solution for smaller spaces like garages. 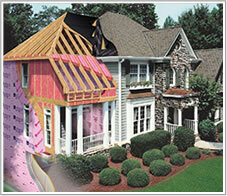 No matter what size your project, Arango Insulation can help you select and install the right Owens Corning insulation. For major residential projects we can even provide the Owens Corning EnergyComplete™ home fiberglass insulation system, which can help a homeowner save up to a third off a home’s energy bill versus traditional spray foam and caulk. We always offer a warranty for one year on all our installation and always pass the manufacturers’ warranties on to you. Whether you’re looking for QuietZone® to soundproof an office, or PINKWRAP® to protect a new home, Arango Insulation can meet your needs quickly and professionally. For any Owens Corning fiberglass and all your other insulation needs in Atlanta, Fayetteville, Marietta, Decatur and throughout Georgia, call or e-mail Arango Insulation today.